직지사대웅전삼존불탱화(直指寺大雄殿三尊佛幀畵)는 직지사 대웅전에 봉안된 후불탱화로 비단바탕에 채색되었다. 탱화란 천이나 종이에 그림을 그려 액자나 족자형태로 만들어지는 불화로, 일반적으로 이 직지사처럼 대웅전 본존불의 뒷벽에 위치한다. 조선 후기에는 대웅전이나 대광명전 등에 흔히 3폭의 불화를 봉안하는 것이 두드러진 특징인데, 이 불화도 그러한 형식을 따르고 있다. 중앙에 석가여래의 영산회상도, 왼쪽에 약사회도, 오른쪽에는 아미타불의 극락회도를 배치하였다. 중앙에 배치된 불화는 석가가 영취산에서 여러 불·보살에게 설법하는 모습을 그린 영산회상도이다. 화면의 중앙에 석가불이 있고 좌우에 8보살과 10대제자, 사천왕 등이 그려져 있으며 둘레에 많은 범문을 써 놓았다. 왼쪽 어깨에만 옷을 걸친 석가불은 악귀를 누르는 항마촉지인의 손모양을 하고 있다. 비교적 균형잡힌 체구와 둥근 얼굴에 부드러운 표정을 짓고 있으며, 머리광배와 몸광배를 세밀하게 그렸다. 왼편에 있는 약사회도는 화면의 중앙에 약합을 든 약사여래가 앉아 있고 그 주위에 8대보살과 사천왕, 12신장 등이 에워싸고 있는 복잡한 구도이다. 본존불의 신체는 건장하고 당당한 모습인데 비하여 얼굴은 지극히 작은 눈과 입 등이 매우 단아하고 엄숙한 인상을 풍긴다. 이러한 모습과 등뒤의 물결무늬 원형광배, 옷의 문양표현 등이 18세기 불화의 시대적 양식을 잘 보여주고 있다. 오른편의 아미타회상탱화는 중앙에 아미타불을 두고 관음보살과 세지보살을 비롯하여 신장상 등이 주위를 둘러싼 구도이다. 이 세 폭의 탱화는 영조 20년(1744) 세관(世冠), 신각(神覺), 밀기(密機) 등 10여명의 화승들이 그린 것을 염불도인(念佛道人) 진기와 지영(智英)스님이 증명한 것으로 전체적으로 짜임새 있는 구성과 뛰어난 묘사력, 안정감 있는 색감 등으로 당시 불화를 대표하는 걸작에 속한다. The hanging painting of a Buddha triad painted in the 20th year of King Yeongjo’s reign (1744) is enshrined in Daeungjeon Hall of Jikjisa Temple. 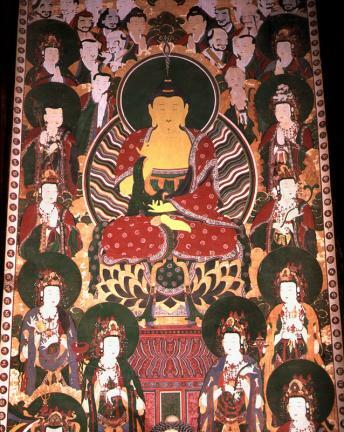 Taenghwa is a buddhistic painting made on either fabric or paper and intended for framing. And like this one, it is usually placed behind Sakyamuni. In the latter period of Joseon, it was common for three sets of paintings to be enshrined in either the Daeungjeon. Therefore, it is clear that this painting followed the fashion of that period. 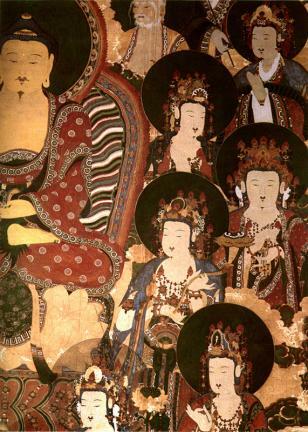 In the center is a painting of Buddha preaching to several Bodhisattvas on Yeongchwisan Mountain. Buddha is placed in the middle and on his right and left are 8 Bodhisattvas including 10 students and Four Guardian Kings. Scriptures are written along the surrounding edges. Buddha's fingers are carefully placed in the mudra form of hangmachokjiin in order to suppress evil spirits, and only his left shoulder is covered with the sacerdotal clothing. He is well-shaped and has a round face with soft expression. Behind Buddha's head is a halo and his back is painted in detail. The light of enlightment harmonizes beautifully with the Sakyamuni enshrined in front. On the left is a picture of a sitting Bhaisaijyaguru Buddha with medicine a case in the center, and around them are 8 Bodhisattvas, the Four Guardian Kings and 12 Guardians. Sakyamuni looks healthy and strong. His extremely small eyes and mouth show grace and solemnity. With the halo behind him, all the description about his face typifies the Buddhistic art forms of the 18th century. 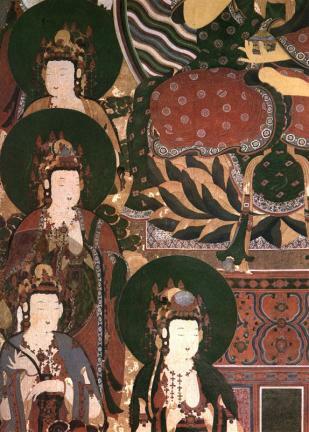 Amitabha is on the right, placed in the center surrounded byAvalokitesvara, Kstigarbha, Guardians of Buddhism and others. These paintings are considered to be the masterpieces of the period for their well-structured composition, their excellent depiction and their well-balanced use of color.